HELLO, EVERYONE. 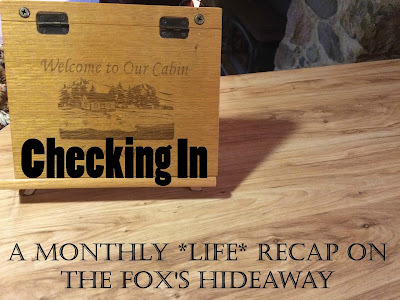 I put this Checking In off until after my trip to the cabin, and then I just got lazy about writing, because not much changes in my life, so I feel like I don't have much to say? But I'm currently listening to a podcast between Victoria Schwab and Yin Chang, and I can't read while I do it and I'm tired of cleaning my room (still not completely done and I've been working on it most of Sunday), and I need to write a post. This podcast is so fun, btw. I'm loving the discussion of writing and sexuality, and I just freaking love Victoria and her books and I'm still crying over the ending of A Conjuring of Light. I'm still working, but we've had a bit of a slow time, so I've been called off a few days. Which yay because another day to catch up on like blogging and reading, but boo because I'm saving up for a new car right now and I'm very much like GIMME MONEY. My mom, little brother, and I made a trip to the cabin. (Fun fact: this picture was taken at the cabin, and I've used it since for my Checking In graphic). This place is owned by a family friend, and they rent it out throughout the year, and we go at least twice. Generally once in the fall, once in the spring. And it is just so fantastic. Though I don't do anything differently than I normally do on the weekends, I have no internet. So I can actually unplug, which is hard for me to do at home, even with my mood nowadays. So yeah anyway, the cabin was fab, of course, and I had a lot of fun playing around with Instagram. I plan to write a post about this social media app specifically, but I'm not a huge fan of it. I think I would be if I had the space to actually take pictures. But I don't, not really, and it's sad, because I really did enjoy playing around with angles and backgrounds at the cabin, and I've got quite a few pictures still stored up in my phone for later. I'm not into the community at all, tbh, but I think it can be a fresh creative outlet when you're tired of your blog or video channel. I just personally prefer Instagram accounts that aren't completely about books. I like leaving my account as a personal and a bookstagram. My feed is a bit of a mess, but it makes me happy. I'm trying to think of more things that happened in the last month-ish, but I can't. I did go to a karaoke night with my cousins who work with me and a bunch of our coworkers. That was SO fun, and even though I didn't sing, I had a great time hanging out with these people in a more social setting (and getting a few drinks! ), and I think next time I might be brave enough to do a duet with one of my cousins. I guess she's planned another karaoke night for this Friday, but I'm not sure if I'll sing yet. (Will keep you guys updated). We've got changes coming at work, including getting a new supervisor (but it's someone we all know so that's a good thing) and people are stressed, but I don't see it being bad. I've got hope that our shift will get better in the coming summer. Speaking of summer, UGH. I'm not a fan of this season at all. I've had some of my worst memories in these months, and my mental health takes a nosedive. But I'm determined, especially now that I finally cleaned off the exercise bike in my room, to take care of myself physically. I'm planning a New Orleans vacation next year with friends, so I've got an end date goal for this, and I *need* to work at it from here on out. But I also think it would just help a lot if I get to a place where I feel good about my weight and body appearance, since that is a huge stress on me mentally. So this summer is about taking care of myself, and ALA annual with my fave Shannon!!! This will probably be my last trip for the year as I'm saving up for a car, but I'm excited for a redo in Chicago and to see one of my best friends again. We're still finalizing the details, but we're for sure doing it, and I hope to see some of you there! That's my big thing, as well as keeping up with this job, which I enjoy a hell of a lot. I've made some friends (still mostly people I just talk to at work, but I've had many personal conversations with one of them, and I'm gaining more confidence re: socializing the more I'm there). I don't always like what happens there or the decisions that are made, but it's better than the previous job I had and it's SOMETHING, you know? I just wish it wasn't so far away, but I'm still carpooling with my uncle so it's not so bad.